The FED yesterday delivered the next round of sugar for the markets. The new program will see $40 Billion of mortgage-backed bonds each month with an unlimited amount of months. They also extended short-term interest rates until mid-2015. Also included was an extension of Operation Twist. All together the FED’s balance sheet just added $85 Billion of long-term bonds each month through QE3. The goal of the new Quantitative Easing program is to help lower the unemployment rate. Apple’s (AAPL) new gadget, the iPhone 5, went on pre-order today. The iPhone 5 pre-orders sold out in one hour. Pre-orders are now being told 2-3 weeks until the phone will be shipped. This means Apple will be able to add a significant number of sales in the current quarter. The heavy flow of traffic caused site problems on the Apple Store and carriers websites. Nine countries are being involved in the initial sale of the phone. Everything looks to this being the biggest release yet for the iPhone. Tiered data plans will help bandwidth issues… those that are lucky enough to be grandfathered into contracts can still get unlimited data plans, for those that are not grandfathered they will have to choose from different tiers of bandwidth usage per month. Apple’s stock saw an intra-day drop during trading yesterday before rebounding. Today the stock continued to rally and closed at a new all time high of $691.28 a share. 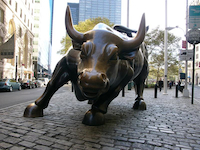 The Dow (INDU) ended up 53.51 points at 0.40% closing at 13,593.37. The Nasdaq (COMP) gained 28.12 points at 0.89% closing at 3,183.95. The S&P 500 (SPX) rose 5.78 points at 0.40% closing at 1,465.77. Oil rose 0.06% to close at $99.06 a barrel. Gold gained 0.05%to close at $1,773.50 an ounce. The 10-Year Note sold off pushing the yield to 1.87%.